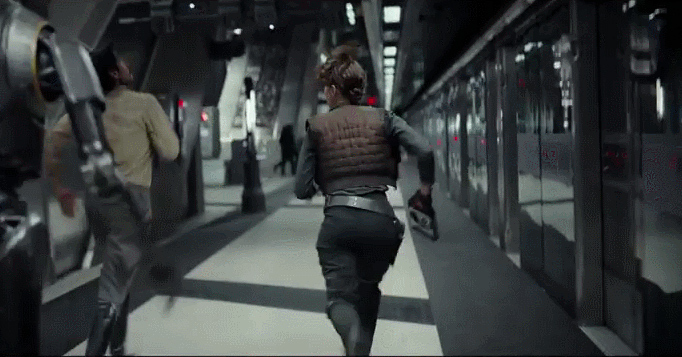 Canary Wharf station on the Jubilee Line, artfully disguised with cladding and digital trickery, appears to have been placed well within the Star Wars universe by Director Gareth Edwards. Keen eyed Londoners have been doing double takes today watching the new trailer for Rogue One: A Star Wars Story. 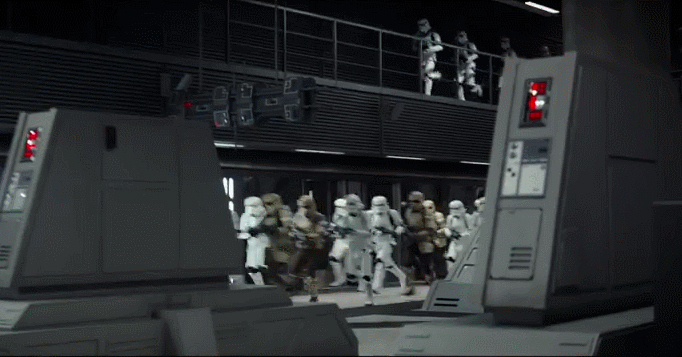 In the brief sequence below we can see mayhem going on (presumably on the Death Star) along a corridor which over 70,000 daily commuters will find familiar. 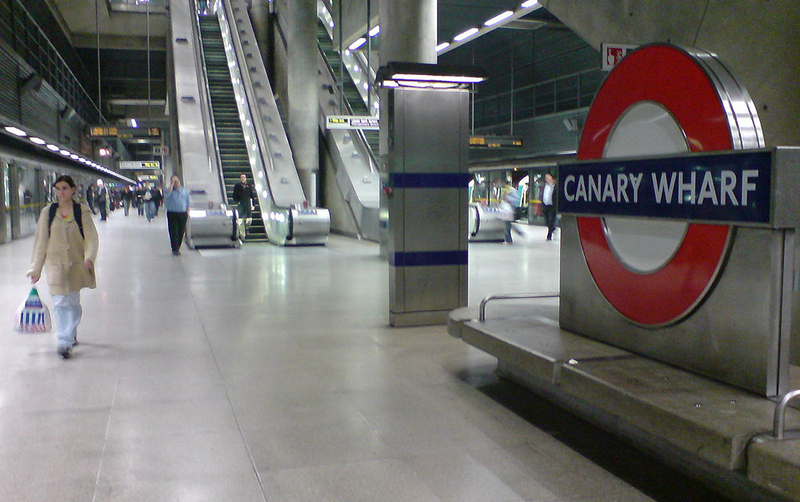 It is the Jubilee Line station at Canary Wharf. Edwards, whose first movie Monsters co-opted surroundings in South America to great effect by painstakingly adding digital overlays to handheld camera footage, is well used to turning the everyday into something fantastical. In Monsters he made small changes, like turning road signs into warnings against Aliens on the loose. He did this without the help of a single green screen; with just a lot of patience and skill expanded the world of his low budget movie into something much bigger. He started out in life as a VFX specialist and really knows what he’s doing with digital effects. Since Godzilla he is used to working with a larger budget, but we’d be interested to see how much of the station was actually changed with physical props, and how much was just edited in the computer. Here we can see the London Transport roundel and bench neatly stashed away, whether by digital trickery or physical cladding. As you can see, the escalators, running gantries and glass doors are all present and correct – but just look a little less Imperial. I guess we’ll have to wait until we see the Blu-Ray and DVD next year to find out exactly how the transformation was made. So is it on the Death Star? The premise of the film is the mission which leads to the Rebels gaining the plans of the weapon at the beginning of Star Wars Episode IV: A New Hope. And with the number of Storm Troopers on foot it certainly looks like an Imperial Base which has been breached. Death Star? More than likely but we can’t be sure. It’s perhaps unfortunate that so much notice has been paid to the location (and I hold my hands up here) but as someone who used to commute there every day I couldn’t help but spot it. I think it’s very, very nicely done though and of course won’t make a single bit of difference to the many millions of people around the world who couldn’t care less where it was filmed. Bits of The Hunger Games: Mockingjay Part 2 were filmed on disused areas of the Berlin U-Bahn and knowing that didn’t impinge on my enjoyment of the movie in the slightest. The film comes out in December and the trailer looks cracking. Felicity Jones as Jyn Erso looks to be an exciting new badass character and the movie could well be a great deal of fun.